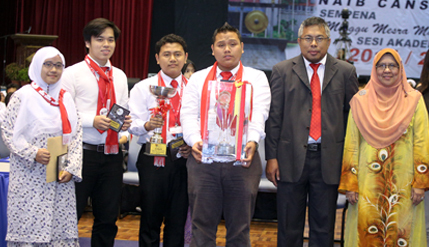 BANGI, 4 September 2014 – The team from Rahim Kajai Residential College has won the National University of Malaysia’s (UKM) Orientation Week Vice Chancellor’s Cup Debate Competition which ended today. They beat the Tun Dr Ismail Residential College team from Kuala Lumpur in the final on the subject “Malaysian Women are still not free” a subject seen to be very much relevant even today where gender bias is still prevalent. The winning team consisted of Muhammad Fikri bin Isnin from the Faculty of Social Sciences and Humanities (FSSK), who was also named Best Debater, Siti Nurfatehah binti Radzi from the Faculty of Science and Technology (FST) and Eric Abdul Rasyid bin Kamarulzaman and Luqman Nurhakim both from FSSK. They took home the Vice Chancellor’s Cup and received individual trophies, certificates of participation and tokens of appreciation. The runners-up were Nabilah bt Tagor Hasibuan, Svgashi A/P Sirarathnam and Khairuzzaman bin Hamdon who also received individual trophies and certificates of participation. The Best Rising Stars in the debate competition was given to Nabilah binti Tagor Hasibuan from KTDI, Siti Nurfatin Izzaty bt Ahamad Izahan from KKM and Muhammad Taufiq bin Abd Rahman KPZ. In the oration competition Nadiah bt Radzali from Ungku Omar Residential College emerged as champion orator beating Nur Najihah Shamimi bt Ahmad from the Keris Mas Residential College and Muhammad Azrul Haziq from Pendeta Za’aba Residential College (KPZ). The winners received trophies and certificates of participation. All the prizes were given out by Deputy Vice Chancellor (Students and Alumni Affairs) Prof Datin Noor Aziah Mohd Awal.